There are SOOOOO many things I could say about these two headlines, but I’ll just say this: With unemployment at 10%, which taxpayers exactly will be bailing out Twin River? What happens when we run out of taxpayers? 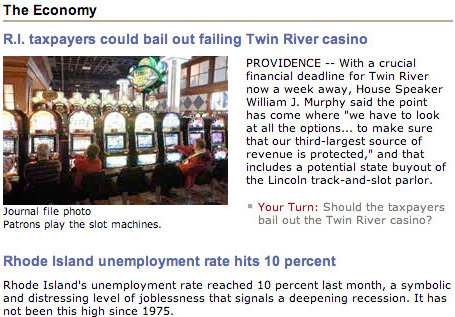 PROVIDENCE - With a crucial financial deadline for Twin River now a week away, House Speaker William J. Murphy said the point has come where “we have to look at all the options to make sure that our third-largest source of revenue is protected,” and that includes a potential state buyout of the Lincoln track-and-slot parlor. THIRD LARGEST SOURCE OF REVENUE!? That’s like me trying to pay my rent with scratch tickets. That is well and truly insane. Didn’t we subsidize this piece of crap project in the first place somehow? Tell me again how it is a revenue source if we have to pay for it? You pay a dollar and they give you a ticket. You use a penny and scratch off the foil and sometimes you win two dollars so you can buy two more tickets… Oh, wait, are you talking about Twin River?